In a recent article, “Back to a Burmese Prison By Choice”(NYT, 12/6/14 U Htein Lin, the Burmese artist and dissident is quoted thusly about his years of imprisonment, “I was completely cut off from art critics and an audience. I just did what I wanted. In the cell I found freedom. It was the most important time in my art career.” Now Mr. Lin makes the journey back to his former prison “to reconnect with a sense of confinement.” Edmund Wilson's The Wound and the Bow intertwined the Philoctetes to myth with the lives of writers like Dickens, Kipling, Joyce, Wharton and Hemingway to show how suffering can lead to creation. And Lin’s career and his nostalgie de la boue, as the French put it, underscores the idea of the part misery can play in generating insight. Of course there are many former dissenters once incarcerated in Burmese prisons who probably don’t share Lin’s fond memories. While pain may result in enlightenment, it more often then not simply crushes the human spirit. Solzhenitsyn who survived the Gulag and Dostoevsky who went onto achieve greatness after a mock execution are the exceptions. In John Frankenheimer’s The Manchurian Candidate, Lawrence Harvey plays the role of Raymond Shaw a former prisoner of war, who has been brainwashed into becoming an assassin. The Times story recounts how Lin used “old prison uniforms,” “syringes,” and “the flint wheels of cigarette lighters” as his palette. It’s a wonderful talent to be able to constantly recycle experience, performing a version of alchemy in which dross is turned into gold. Hannah Wilke the sculptress made her own death the subject of her last pieces. 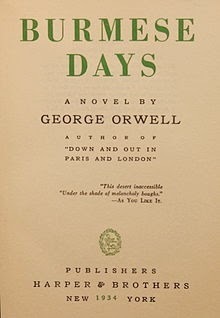 Lest we forget, George Orwell’s first novel, Burmese Days, derived from his deployment as a police officer during the waning of the Raj.The only problem would seem to occur when things are good. Many artists become so attuned to making their own subjective experience into an object that they are no longer able to enjoy the unmediated experience of reality.